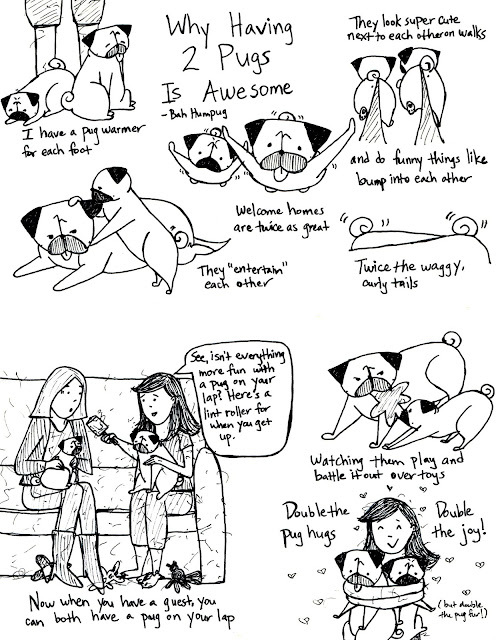 When I was first contemplating getting a second pug last year, some of my family members advised against it, saying it would be too much extra trouble and cost, and fearing that I'd devolve into a crazy pug lady (ha! too late - already am!). But now that I have Rosy, I can't imagine not having both her and Sunny! Even my formerly doubting family members love her and see how happy I am with my two pugs. 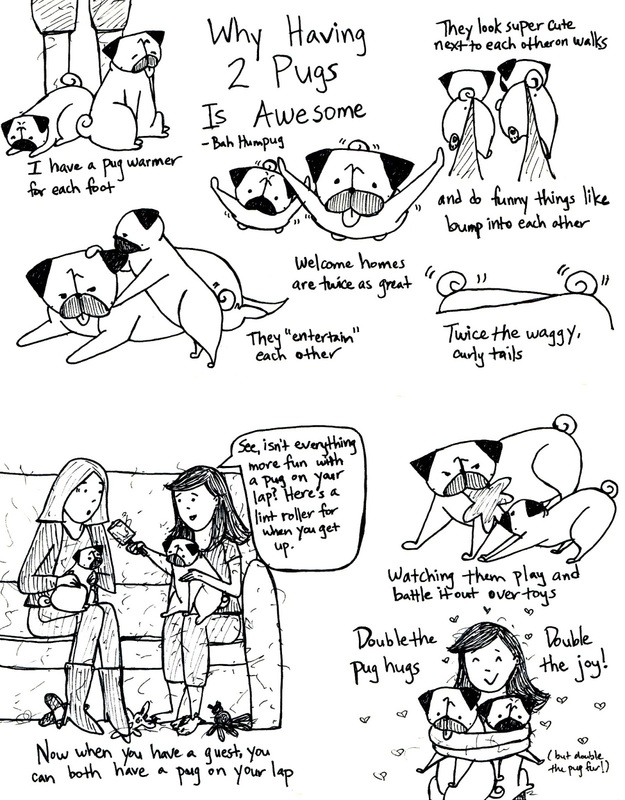 For any of you contemplating whether to get a second pug (or other dog), here are a few advantages to having two of them! P.S. I have a habit of updating my look in my drawings, especially any hair changes. So in case you were wondering if I was just being inconsistent, I did recently get a hair cut and shorter bangs again, which explains the different hair here. I can't help it, it just tumbles out of my pen! We have 2 pugs. This past Christmas we offered to foster 1 more. 3 pugs is 1.5x the fun of 2!! :D Love your drawings! I thought I'd let you know that your blog is one of the Things I Liked in 2013! I may not have a pug, but I really enjoy your drawings! Why wouldn't a guest want a pug on their lap? I think pug owners are keeping the manufacturers of lint rollers in business. love this! i got my own second pug in the fall and though it is sometimes more work, it's all worth it. i just love seeing them snuggle! We have two pugs this time and although it's very different from what we were used to with our angel Payton, it is wonderful all the same.